A few weeks ago I found out that my recent weaning blog post had won in a competition through the Tots 100 to attend the Plum Baby Cookery School (as well as £500 and a video camera!) - I was really excited as one of my favourite TV chefs was going to be there, Rachel Allen. I love her cookery books and programmes - big fan! So the plan was put in place for Noah and I to get ourselves over to Buckinghamshire for a couple of days and knuckle down to some cooking at the wonderful Beverley Glock's (food writer, broadcaster)amazing house. I have to admit that I didn't really realise what we'd be up to before going there and I also spoke about the whole thing with trepidation to friends, as an overnight trip with Noah didn't thrill me, as imagined him not sleeping in a hotel room and keeping me and the other guests up all night! I'm happy to report he did no such thing - he was the best little boy ever - even if my evening in the hotel room was a bit dull, at times hiding in the bathroom, just keeping as quiet as I could and eventually giving in and going to bed at 9.30! So, Noah and I set off on our road trip at 7.30am and luckily I allowed enough time as a coach fire on the M25 set us back an hour! On arrival we met the other mums and babies in the gorgeous setting of Beverley's garden. We shared travel nightmares and introduced all the babies. We met Becky and Izzy, Becky and Holly (2 Becky's very confusing! ), Maria and Teagan and Therese and Patrick. All babies were (naturally) gorgeous and none were camera shy - all working the camera in their own special way. So what did we get up to? In all honesty I had no idea really what we were going to be doing and this is what I love about all things blog related that I get myself into (bra model at The Baby Show springs to mind!) 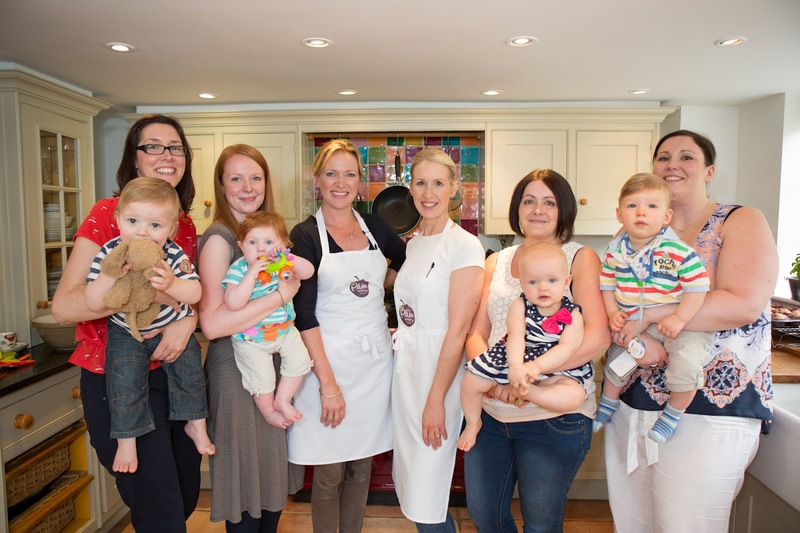 - we are to be the stars of some new films for Plum Baby on cooking for your babies and catering for their ever changing needs as they go through the stages of weaning. 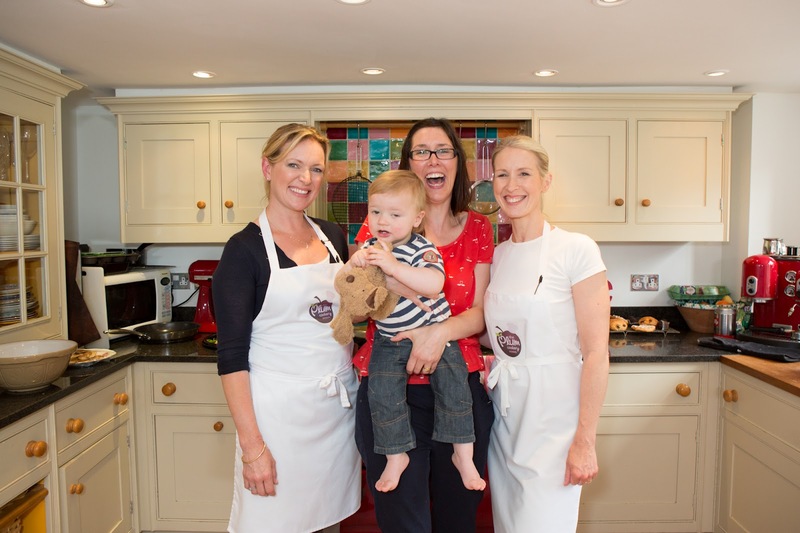 Beverly and Rachel were to be our teachers and presenters of the Plum Baby Cookery School. For two days in the setting of Beverley's amazing kitchen (Aga - WANT!) it was 'lights, camera, action', we were filmed, had cameramen surrounding us, lights shining on us, had a sound boom waving over our heads - the only thing that was missing was 'make-up'! 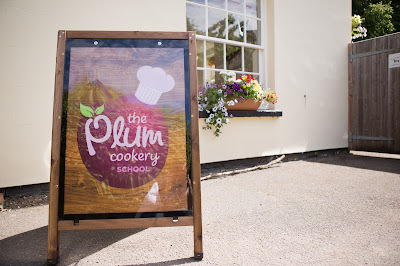 We were taught how to make some of the Plum recipes from scratch, which was brilliant as it showed me how easy these meals really are and how not many ingredients are actually needed. Personally I love Plum and Noah has also shown himself to love many a Plum pouch so to know that I could easily rustle up one of his faves Minted Pea and Lamb in double quick time was great. The emphasis was also on making meals that ALL the family can enjoy - Sweet Cape curry is next on my list to make. My cookery highlights from the 2 days are - well all of it actually - but if i had to whittle it down it would be the Beef Stronganoff - and actually wanting the cameramen to keep needing new shots of us delving into the bowl for more! The other one would be the delicious Sweet Cape Curry - that was lunch on day two. All in all it was a wonderful adventure for Noah and I. It was a bit strange for him going away with mummy for 2 days and also hanging out with a load of people he didn't know but I'm all for him doing new things and meeting new people. We loved meeting everyone, Beverly, Rachel, Maria and Therese - and I have to give special mention to the two Becky's who also blog - check them out at The Ar Blog and Munchies and Munchkins - all are amazing mums. Thank you Plum Baby for the experience! Lovely Post!! It was great wasn't it!